Qais al-Khazali, leader of Iraq's Shi'ite militia Asaib Ahl al-Haq, speaks to supporters during a parade in Karbala, March 21, 2014. One of the key figures participating in the fight against the so-called Islamic State group in Iraq is a Shi’ite militant who less than a decade ago helped coordinate a brazen attack on U.S. troops that left five American soldiers dead. 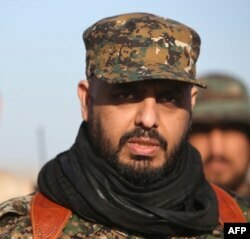 Qais Khazali commands the Asa’ib Ahl al-Haq (AAH), “League of the Righteous,” an Iranian-funded Shi'ite militia, which, along with other Shi'ite militias, is playing a powerful role in helping turn the tide against the Islamic State group in Iraq. His story illustrates the complex dynamic on the ground in the Middle East where a variety of forces are fighting for control of parts of Iraq and Syria and where traditional enemies find themselves fighting a common foe in the Islamic State group. Mourners chant slogans against the Islamic State group during the funeral procession of three members of a Shi'ite group, Asa'ib Ahl al-Haq, who were killed in Tikrit, in Najaf, March 11, 2015. It highlights, too, some of the challenges facing the Obama administration and the West as to whom they align with in the battle against Islamic State militants. Khazali was born in 1974 in the Shi'ite slum on the outskirts of Baghdad once known as Saddam City. Like many disenfranchised young Shi’ites who bristled living under Iraqi leader Saddam Hussein, Khazali was attracted to the teachings of Shi'ite cleric Sayed Mohamad Sadiq al-Sadr and became one of the scholar’s leading students. Sadr was gunned down by government forces in 1999 and Sadr’s son Muqtada assumed leadership of the movement. After Baghdad fell in 2003, Muqtada formed the Mahdi Army and waged war on the U.S. coalition. For a while, Khazali served as the group’s spokesman but ultimately broke away to form a militia of his own. AAH targeted coalition forces and Iraqi police with improvised explosive devices (IEDs), rockets, mortars and sniper fire and would later claim more than 6,000 attacks. One of the most spectacular occurred in January 2007, when about a dozen AAH fighters attacked a government compound at Karbala, killing five U.S. soldiers. The attackers wore American military uniforms and badges, carried American weapons and drove in black SUVs identical to those used by the U.S. military. The U.S. military later concluded that only Iran could have orchestrated the operation. Khazali was later captured and detained at the American prison known as Camp Cropper. He was extensively questioned by U.S. intelligence. “He is the kind of person I could see myself, or others, following,” said Derek Harvey, a retired Army colonel and former intelligence adviser who spent hundreds of hours interviewing Khazali at Camp Cropper. From inside prison, Khazali continued to wield influence. As detailed in a 2014 Reuters report, Khazali ordered -- with a phone call from jail -- that attacks on American and British forces be halted. Harvey would not get into the specifics of his conversations with him but said Khazali “knew things that were going on in Baghdad before I did” -- even behind bars. Khazali was released in late 2009 along with other AAH members in what appeared to be an exchange for British hostage Peter Moore, though the U.S. and Britain have denied making any deal. “When he came out of jail, he had more legitimacy,” said Behnam Ben Taleblu, an Iran research analyst at Foundation for Defense of Democracies, where he has tracked AAH’s rise. In 2012, Tehran called on its allies to help protect the Assad government, and AAH sent fighters into Syria. There, the militia was able to hone its fighting skills. “I think sending our men to fight in Syria was the right decision," Khazali told the BBC in 2014. “Al-Qaida has had a lot of practice in street fighting. If our guys hadn’t gotten the experience in Syria, al-Qaida and ISIS could have taken Baghdad,” he said in the interview, using an acronym for the Islamic State group. Today, AAH has grown to a 10,000-member force and is considered as one of the most powerful of the dozens of Shi’ite militias that operate in Iraq. Analysts believe much of the group’s prowess is due to the training and money it receives from Iran -- as much as $2 million a month, according to Iraqi intelligence officials. The group’s main Iranian patron is thought to be Iranian general Qassem Suleimani, commander of the Quds Force of the Iranian Revolutionary Guard Corps, a man the U.S. formerly designated a terrorist. AAH helped break the Islamic State siege of Amerli in August 2014 and is currently taking part in the battle to retake Tikrit. “This is the most overt conduct of Iranian support, in the form of artillery and other things,” Dempsey recently told the Senate Armed Services Committee. But at the same time, U.S. officials are said to be worried about what might happen when Tikrit falls. 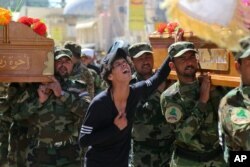 Human Rights Watch said AAH and other Shi'ite militias have a history of revenge attacks on Sunni civilians, including kidnapping and executions. In addition, Tikrit is the location of Camp Speicher, where in June 2014 Islamic State militants executed hundreds of Iraqi troops, most of them Shi'ite. “If this becomes an excuse to ethnic cleanse, then our campaign has a problem and we're going to have to make a campaign adjustment,” Dempsey said. For now, the Pentagon said it is keeping a close eye on the situation. Iran will be watching closely as well, said Alireza Nader, a senior analyst at RAND, to make sure that AAH doesn’t grow too strong. “They want to make the Shia political and military spectrum is fractured so that no one group emerges to challenge Iran,” Nader said. Retired Army colonel Harvey said it is unlikely AAH and Khazali will put down their arms even if IS is ultimately defeated. “They’ve been empowered, and their brand has been enhanced tremendously,” he said.